Jimmy the cat was hungry. He wanted to get his owner's attention but he was too busy reading his book so he didn't notice Jimmy. Jimmy had an idea. He jumped off the back of the couch planning to land on his owner but as he jumped, he flew straight over him and headed for the cold fish tank with only water in it. Jimmy was so scared that he grew angel wings and flew up to heaven. Then he forced himslef back down and landed on his owner's head. But he still didn't get the owner's attention. One day I was bored. I saw James and he was reading a book, it looked fun. I said to myself, "Maybe I can have fun by giving James a fright!" I got onto the couch. Just then he started laughing. It was so loud, it gave me a fright! I jumped so high that I came down so fast and my claws immediately came out and I landed on James! When I heard James yell, "Aghhhh," I ran away so fast so James couldn't find me and I started meowing. "Meow." Then he found me and yelled at me. I was mad! Hi I'm Tom the cat. Today is April Fool's Day, and I'm going to playing a little trick on Maison. He's the human by the way. Good! Maison's reading a book, that's a pretty good distraction. Alright off I go. OK, right now I'm behind the couch and I'm just about to do my trick. Ok, 1, 2, 3 go! Rahrrr! I jump up and leap out from behind the couch and aimed for Maison's head but I missed and instead of landing in Maison's head, I ended up slamming my body on the wall. What happens next? Do you know? One day when my owner Jeff was reading his book about Minecraft, I decided to play a prank on him because he wasn't looking after me. So I jumped off the couch and I was gliding then I dropped on his head with my claws out. Then I clawed his head. He popped up and said "OW, my head!" really loud. Suddenly I said, "you weren't looking after me!" Jeff said, "oh my cat just talked." Then Jeff ran...I said, "Jeff, come and feed me!" He was running so fast! All morning Jack was ignoring me. He was reading a book in the lounge. It was April Fool's Day so I decided to glide over him to get his attention. "Ohhh noooo!!!!" I landed on his head and I ran away. I sure got his attention! I heard Jack yell. I jumped out the window as fast as lightning. I knew Jack was really angry. As I was running away I fell into a deep drain. I kept falling down into the sewers. I heard Jack yelling for me and I saw him walking past but I didn't go home again. Once upon a time I was sitting on the comfortable couch in the lounge by the curtain and I got my book and started to read my book. Suddenly my cat clawed me and said "Meoooooowwwww." He had climbed up the apartment wall and climbed in the window and climbed up the back of the couch. My cat sprang up and landed on my head. One day I was sitting on the snuggly furniture. Suddenly the cat appeared and then the cat clawed me and I ran out the door to the kitchen. I bled. I put bandages and plasters on. I looked like a scary mummy. The cat was hiding in the then the cat jumped on the dinner table. One night I was sleeping in my bed. I saw a scary tree branch shadow through my window. It was stormy and windy. I looked out my window and suddenly I saw a monster climbing up my house wall. I started screaming and ran into my Mum and Dad's room. Then I snuggled into the middle of their bed. Next thing I know it was morning, I was so relieved. I went into my own room, looked out my window and there was no monster so I went into the kitchen and ate a whole jar of cookies! "Yum, yum yum." One scary, dark night I went camping with my Dad. We went to the scariest place. We set up the tent and went to bed. In the middle of the night suddenly I saw a pig with a gun and a chainsaw. He came out of a cave with a BLAST. He went bang, bang, bang and I ran into the tent. He went roar, roar, roar. He crashed down our tent. Dad woke up and said, "Run! Run for you life!" We ran and ran until we found the three pigs house made of brick and hid there! On Friday 13th it was a dark, stormy night. Lightning struck and missed a girl by inches. The girl was called Dianne. She believed in ghosts and zombies. She was lost and suddenly she saw a dark hooded figure behind her with a machine gun. For the first time in her life Dianne was scared. He heart was beating so fast she couldn't feel it. Dianne ran to the end of the street, "Wait!" said an unfamiliar voice. She realised it was the dark hooded figure. She stopped and the hooded figure was waiting. The hooded figure pulled out his machine gun and...boom! Dianne opened her eyes and saw a dead boy lying on the pavement. One day I was sitting in my spa enjoying my 20 million pancakes, watching my flatscreen TV when suddenly I saw my Dad in a Weetbix commercial! I dropped my breakfast, jumped out of the spa and ended up hugging the TV screaming, "We're gonna be rich, we're gonna be rich!" I managed to get over it. When my Dad got home I said, "How much money did you get today?" And he gave me two dollars! My mouth just fell open. Then he said, "Can you help me get the other 20 million dollars out of the car?" This week we started our 100 Word Challenge. The 100 word challenge is a weekly creative writing challenge. Each Monday a prompt is given, which could be a picture or a series of individual words and we can only use up to 100 words or 5 sentences to write a creative piece of writing. We then spend 20 mins writing. Each week some of our stories will be showcased on our blog. Here are some of the stories we wrote today! It was a very nice sunny day and I was fishing. Next to me was my best friend, Jelly. I felt my rod bending but it was just a puny great white. Then Jelly felt a tiny tug...I know it was a big one! He pulled up this mutated sloth. It looked like an eel!! Jelly pulled out his uzi so I closed my eyes. I could hear around 20 shots. I though he must hate sloths! But when I opened my eyes, he was on the ground dead and the sloth WALKED away! It was was a sunny day, Steve went out fishing. He paddled until he got to the middle of the ocean. He pulled out his fishing rod. Suddenly he felt a really strong tug. He pulled out a big ugly fish. It looked like a worm...the eyeballs were poking out, it smelt like a rotten egg and it was as slimy and slippery like soggy biscuit. He pulled out his machine gun, shot the bottom of his boat, he sunk! One sunny afternoon Steve was fishing in a boat in the middle of the Pacific Ocean. He took bait and quickly put it on the hook of his fishing rod. Then he flung the hooka attached to the rod into the water. he waited and waited and waited and then suddenly he got a bite on his rod, it was going all over the place like crazy. Later after all that pulling he finally pulled the rod out of the water. He couldn't believe his eyes, it was an ugly worm-like eel thing. He didn't like the look of it! It all started on a sunny day. Sophie was fishing on her boat in the middle of the ocean. Suddenly her rod moved and bent and when she tried to heave it...it was too strong. Then with a mighty pull, she pulled her rod out one last time...and there was a slimy abomination. She gazed at it with horror. It's eyes were as big as dinner plates and when she took the hook out, there were teeth as small as ants and the mouth was as huge as a ball. After that day she never went fishing again. On a sunny day Max went fishing in the middle of nowhere. He put the fishing pole in the water. He waited and waited and waited until he couldn't believe his eyes when he pulled out a giant sea monster. 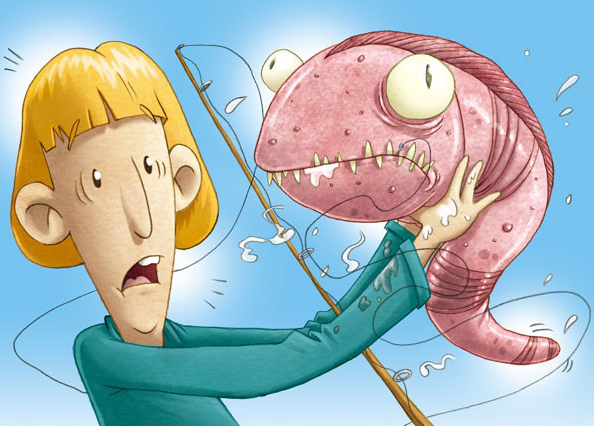 He was frozen and the fish was wiggling, his teeth were as sharp as swords and his eyes were as big as a basketball. He tried putting it back in the water but it was too late. The fish ate him. He tried getting out but he couldn't. Then he had to stay there forever...will he get out? Today is a very special day - it is Albert Einstein's birthday. Albert Einstein is our class mascot for many reasons. He is widely considered to be the most intelligent person in history but interestingly if you had asked Einstein himself about that, he would have disagreed. From Einstein we learn the value of asking questions. Although Einstein is know for his achievements in Maths and Science, he believed that being smart is not about knowing everything. He believed that creative pursuits such as art and music are just as important as reading, writing and maths. Albert Einstein shows us the importance of perseverance. "I think and think for months and years. Ninety-nine times, the conclusion is false. The hundredth time I am right." and "It's not that I'm so smart, it's just that I stay with problems longer." And he even had lessons for teachers. 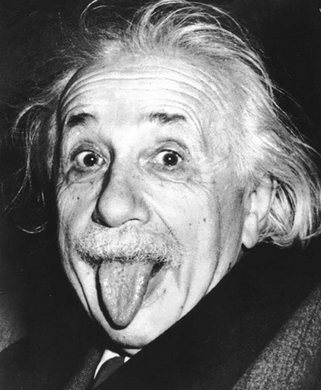 Happy Birthday Albert Einstein! We look forward to learning more from your wisdom. 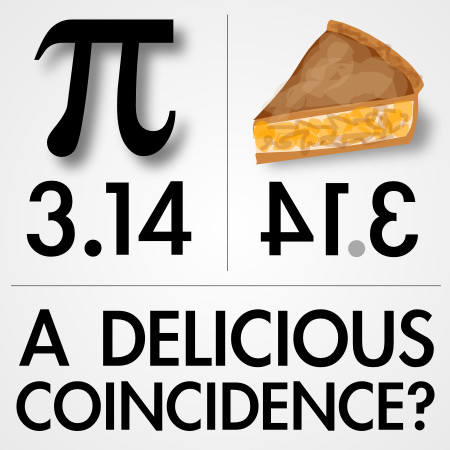 Today is special for another reason - it's Pi Day. In number form, Pi is written as 3.141592653 - but that's just the beginning. Pi has an infinite number of digits. You'll never be able to write them all - they continue forever. That's why we need the symbol! Happy Pi Day! Will you eat some pie to celebrate? Actually I wonder if that's where it gets its name ... what do you think?